This past weekend, on our one day San Juan Islands kayak tour, we found an unusual jelly fish that we have never before encountered in this area on our kayaking trips. As you can see from the photo, it was stunningly beautiful with an amber bell, purple stinging tentacles, and pink oral tentacles. It was about 8 inches in diameter and 2 feet long. 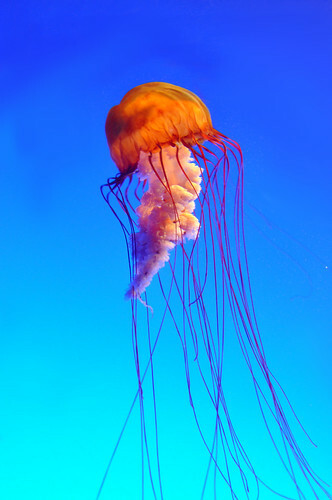 It turned out to be a type of true jelly in the class Scyphozoa, commonly called the sea nettle. Several other species of jellies are commonly called “sea nettle” so its important to know the scientific name for jellies to avoid this kind of confusion. Chrysaora fuscescens is common in coastal waters of California and Oregon, less so west to Japan, north to the Gulf of Alaska, and south to the Baja Peninsula. It usually reaches its greatest abundance in late summer or autumn and it one of the few jellies to survive well into the winter months. Chrysaora fuscescens does not often venture into inland waters like the San Juan Islands so far from the Pacific Ocean. But this would be the best season to find one, and this year especially so. That’s because some scientists suspect that its population is increasing due to human influences, such as excessive nitrogen from sewage and farms, and higher ocean temperatures. If true, this jelly may be having a negative impact on larval fishes such as salmon that are crucial to our eagles and orca whales. Chrysaora fuscescens can grow as large as 3 feet in diameter, although most are less than 1 foot across. The long, spiraling oral arms and the 24 tentacles may stretch far as 12 to 15 feet. It is commonly displayed at public aquariums because it is colorful and relatively easy to raise. It takes only 3 months to bring them from polyp to adult. Pain caused by its sting is similar to that of a bee sting or brushing across nettles and does not have serious effects except in those individuals who are sensitive to the toxin. The San Juan Islands are home to over 60 species of jelly fish with the greatest diversity present in spring. By summer, our waters are dominated by about 10 large species that have consumed all the smaller types! Some of our jellies glow at night making quite a spectacle on our bioluminescence night kayak tours. These jellyfish were seen quite frequently while we made our way around the islands these past two weeks. Great to look at, glad i wasn’t the only one who noticed!